Hi there, this is your brain speaking. 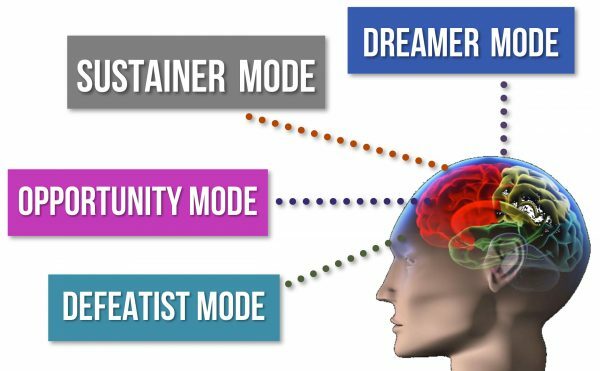 Just wondering what thinking mode you are operating in today? Seems simple, but it’s important to know what’s going on up there. Success in today’s hyper-competitive world depends on what’s happening upstairs in that frontal lobe of your brain where problem-solving, creativity and other cognitive functions take place. Our research with thousands of managers and individual contributors throughout North America and in 48 countries suggests that we need three to four times as many ideas every day to perform at peak levels in our work. Anything less than a constant flow of ideas won’t be sufficient as we enter a future of constant change. It’s very easy to fall into one of the less productive thinking modes without even being aware of it. It’s an inescapable part of human existence to sometimes operate from the Defeatist or Sustainer Modes. But in awareness there is power. Become self aware and identify when you’re in a negative mode and use the strategies above to shift. Opportunity Mode is what you’re in search of; it’s where productivity originates, performance is dramatically increased, and it’s where your ideas flow like a mighty river.